"Quick and easy way to prepare homemade, flavorful fajitas for a crowd!" Combine vegetable oil, chili powder, oregano, garlic, onion, cumin, salt, pepper, and cayenne pepper in a large resealable plastic bag. Add chicken tenders, bell peppers, and onion; shake to mix. Marinate chicken mixture in the refrigerator, 30 minutes to 2 hours. Preheat oven to 400 degrees F (200 degrees C). Line a rimmed sheet pan with aluminum foil. Spread chicken mixture onto prepared pan. Roast in the preheated oven, stirring halfway through, until chicken is no longer pink and bell peppers soften, 15 to 20 minutes. Sprinkle cilantro and pour lime juice over chicken mixture; toss to distribute. Use a variety of bell peppers and spicy peppers as desired. Spray the sheet pan with nonstick cooking spray instead of lining it with aluminum foil if preferred. This is an excellent idea and the chicken was so moist and flavorful. I used fajita seasoning instead of buying the spices separately. 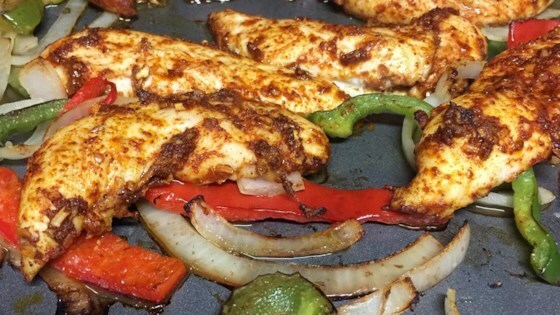 Wow, Ive done fajitas for years, but these are quick, easy and delicious. I did cook at 425 for about 5 extra minutes. Next time I will cut the tenderloins in half. Delicious!